Columbine 'Cameo Rose-White' - Buy it Now! 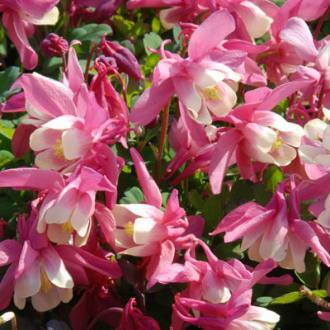 'Cameo Rose-White': 6", A dwarf form of columbine that only grows six inches tall. Large flowers stand atop a low mound of foliage. The flowers have rose outer petals surrounding white inner petals. It blooms in mid to late May and is in bloom for weeks. A charming addition to the flower bed or rock garden. A live plant. - $15 each or 3 for $42.75 - You save $2.25!